Mayor’s Office of Media and Entertainment (MOME) Commissioner Julie Menin and CUNY Graduate School of Journalism (J-School) Dean Sarah Bartlett today announced that MOME will grant $1 million to the J-School to create new programs to help New York City’s community and ethnic media outlets stay competitive in the current media landscape, and bring them further into the digital age, says a press release issued by the MOME. This funding will allow a major expansion of training opportunities for journalists working at these publications, which have an enormous readership and are of vital importance to communities around the city. In addition, the J-School’s broadcast facilities will be officially renamed the “Made in NY Broadcast Center” in recognition of MOME’s commitment to this important element of New York’s media sector. New York City is the ethnic media capital of the world, with more than 350 community and ethnic outlets that produce news in dozens of languages for print, radio, television and the web. A significant portion of New Yorkers – one-third of whom are foreign-born – rely on these outlets as a key source of news and information. Combined circulation of daily and weekly community and ethnic publications reaches 4.5 million people – more than half of New York City’s population. The CUNY J-School launched the Center for Community and Ethnic Media (CCEM) in 2012 to address the need to support these news outlets in particular, and help them tackle the unique challenges they face. Mayor de Blasio and Speaker Melissa Mark-Viverito announced an expansion of New York City’s outreach and engagement with community and ethnic media in January of this year, including the launch of an online directory of ethnic and community media for City employees to use in outreach and informational and paid campaign efforts, and a system to ensure accountability with the aim of having equitable communications across diverse ethnic, racial and geographic communities. While New York’s community and ethnic outlets are a key element of the city’s media landscape, many of them are struggling to keep up with the quickly evolving world of tech-driven journalism. In addition, many of the news outlets that CCEM serves are under financial pressure. Their employees often wear multiple hats: reporter, publisher, editor, photographer, ad salesman, and social media director. These publications are stretched thin: they often cannot afford to devote resources to professional development, and few have been able to fully migrate to a digital environment. Through this grant, MOME will provide CCEM with the means to create new, affordable courses building on the J-School’s current offerings in subjects such as social media, video storytelling, podcasting, and broadcasting techniques. It is estimated that MOME’s grant will allow the J-School to train between 200 and 300 journalists annually. 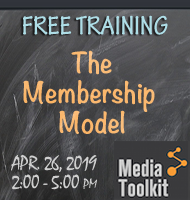 Multimedia and data visualization: Journalists will receive training with tools for multimedia presentation, training on Microsoft Excel, and sessions on how to effectively use data visualization. Video: Courses will focus on video storytelling for the web, the fastest-rising application in the news industry and one that is increasingly drawing the attention of advertisers. Social media: Participating journalists will learn to use platforms such as Twitter, Facebook, and YouTube effectively. 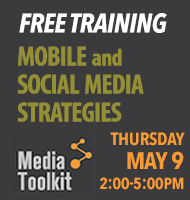 They will also learn strategy around different social media platforms, and how to use analytic tools to inform content. Podcasting: Using the “Made in NY Broadcast Center” facility, participating journalists will learn about the components of a podcast and have the opportunity to make their own. Broadcast skills: Courses will provide journalists with training for on-camera appearances, as well as practice with public speaking and presentation skills. 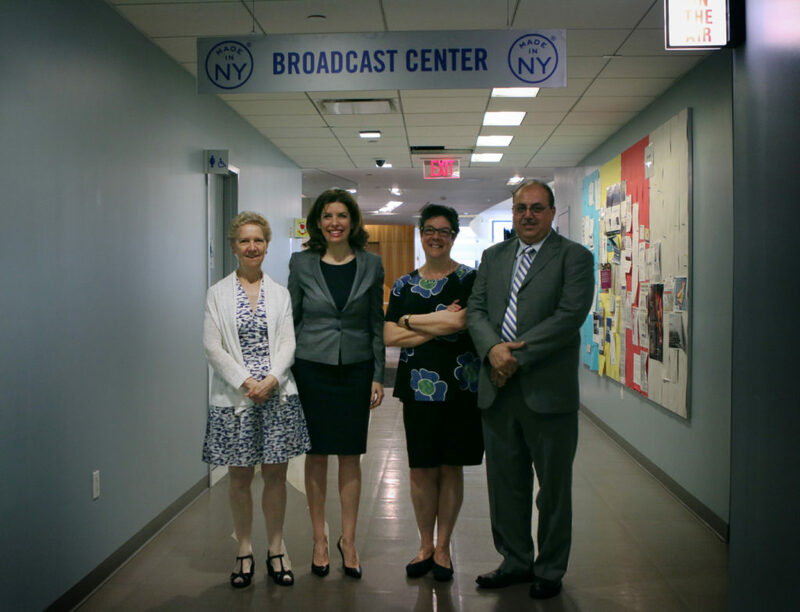 In addition to the professional training afforded by this grant, CUNY J-School’s broadcast facility will be renamed the “Made in NY Broadcast Center” in recognition of MOME’s support of the school. This broadcast center is composed of a high-definition TV studio and radio recording facility, all with cutting-edge equipment including DSLR cameras, video cameras and audio recorders. Training for community and ethnic media reporters at the “Made in NY Broadcast Center” will include use of camera, audio, video, and lighting. The Mayor’s Office of Media and Entertainment (MOME) is comprised of two divisions. The Office of Film, Theatre and Broadcasting encompasses film, television, radio, theatre, music, advertising, publishing, digital content and real estate as it relates to the creation of creative content. It serves as a one-stop shop for the entertainment industry, which has seen explosive growth over the last year in New York City, contributing nearly $9 billion and over 130,000 jobs. The Office promotes New York City as a thriving center of creativity, issuing permits for productions filming on public property, and facilitating production throughout the five boroughs. The Agency also oversees NYC Media, the City’s official broadcast network and media production group, which has a reach of over 18 million people and provides programming for six local cable stations, including award-winning programs on the popular NYC Life (channel 25), as well as one radio station. You can also follow us on Twitter, Instagram and Facebook. Established in 2006 under founding dean Stephen B. Shepard at a time when the industry was reinventing itself for the digital age, the CUNY J-School is at the forefront of equipping the next generation of journalists with the tools to find stories and tell them effectively — using print, broadcast, visual, interactive, and social media. The Center for Community and Ethnic Media, located at the CUNY Graduate School of Journalism, serves as a hub of research, training and professional support for community and ethnic publications in the New York City metropolitan region. If you are a member of the Metro New York-based community and ethnic media and wish to receive CCEM’s announcements about events, trainings and Voices of NY’s daily news digest, you can sign up for our email alerts by clicking here.